Little Giant P-AAA-WG (523375) fountain and pond submersible pump contains non-toxic mineral oil, providing continuous lubrication for maximum motor life. The 1-A (500203) small submersible oil-filled pump with epoxy coated cast aluminum housing. Is used for commercial, industrial and home applications including statuary fountains, water displays, air conditioners, machine tool coolants, and many other applications where liquid must be transferred or recirculated. Little Giant Fountain & Pond Submersible Water Pump. Contains non-toxic mineral oil, providing continuous lubrication for maximum motor life. Corrosion resistant nylon housing. Impedance protected. Operates submersed only. 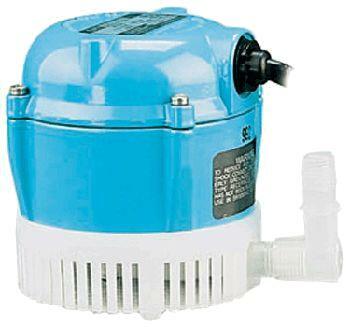 Little Giant Submersible Pump 170 GPH # 1-A (500203). Operates submersed only. Small submersible oil-filled pump with epoxy coated cast aluminum housing. For commercial, industrial and home applications including statuary fountains, water displays, air conditioners, machine tool coolants, and many other applications where liquid must be transferred or recirculated. This pump is not recommended for aquariums, swimming pools and fuel oil transfer. How do I chose the pond pump? For Fountains (Indoor or Outdoor) - When choosing a pump for your fountain there are two terms that you will see when looking for your pump. GPH (gallons per hour) and "lift" or "head". To calculate the capacity required figure to circulate the water in the pond at least once an hour. If you have a 500 gallon pond you would need a pump that moves 500 gallons per hour at the height of the discharge. The lift or head (height of the discharge) is the term for the vertical height the pump raises water above the surface of the pond. You will need a pump that lifts higher than that measurement because every 10' of tubing equals 1' of lift). If that distance is 24", than you will need a pump that lifts at least 36" high. The "maximum lift" means the maximum height that the pump will lift the water. So you will get "0" flow at the maximum lift. Can I use a sump pump for my waterfall, koi pond, or garden pond aeration? No. Sump pumps are designed for short periods of operation. Running a sump pump for too long can cause the pump to overheat. It is also oil-filled. If fish waste attacks the pump seals, or it overheats, that oil can be discharged into your water feature. That will kill the fish and plants. When it cools, it will draw water up inside the pump motor which will kill the pump. Using a sump pump any place where water recirculates is not recommended and will void the warranty. What are permanent split capacitor pond pumps? Large Volume Plastic pumps - These pumps utilize a permanent split capacitor (PSC) motor sealed in a Stainless Steel Housing, which in turn, is surrounded by a plastic case. The PCS motor allows these pumps to use less energy than other pumps of similar flow capacity. The motor also produces less heat ; therefore, the pump does not require oil internally. These pumps are ideal for use in waterfall and stream applications, found in water gardens. What are Epoxy Encapsulated (Potted) pond pumps? Epoxy Encapsulated (Potted) Pumps - These pumps feature an epoxy-encapsulated motor, plastic housing, and radial lip seal on the motor shaft. They provide enough power to effectively operate a water garden, statuary or tabletop fountain. Algae build-up does not effect these small, powerful workhorses. In fact, they may even be used in some harsh, industrial-type applications. These "potted" pumps are usually more compact in size than an oil-filled pump of equal flow capacity. What are Wet-Rotor (Hysteresis) pond pumps? How do you calculate the approximate Gallons of Water in a in a circulat pond? How do you calculate the approximate Gallons of Water in a in an irregular pond? How do you size a pond liner? Use the same formula for both the width and the depth of the liner: The length of liner = max length of pond + (2 times max depth) + minimum of 2' overlap. The width of liner = max width of pond + (2 times max depth) + minimum of 2' overlap. How do you calculate how many gallons in a pond? What size pump should I use in my pond? By turning over the water at least once an hour through the filtration system you will reduce the amount of maintenance required. A 3,000 gallon pond will require products that can handle at least 3,000 gallons per hour of flow. How many GPH should the pump deliver to make a stream flow look natural? How do I figure the head required by the pump? Should I use an external or a submersible pump for my pond? In both the external and in the submersible pumps, the mechanism is simply: a set of turning blades that pressurize the pond water and force it into motion. Submersible pond pumps are easier to use than external pond pumps. They sit directly on the water and are inexpensive, unlike external pumps that you must place outside the pond. Submersible pumps are easy to install and run without priming. They can be used to power all but the largest water features. What size tubing should I use to maintain an adequate flow in my fountain? To maintain adequate flow, use a larger diameter tubing. Make the tubing as short and straight as practical, and be sure it doesn't kink during installation. Minimum tubing sizes are: 1/2-inch diameter for flows up to 120 gph; 3/4-inch diameter for flows up to 350 gph ;1-inch diameter for flows up to 1000 gph ; 1 1/4 inch for flows up to 1500 gph ; 1 1/2 inch for flows up to 3000 gph You can "telescope" together a series of incrementally larger sizes to make the transition. Vinyl hose comes in increments of 1/4" in inside diameter (ID) and has about 1/16" wall thickness. The smaller tubing will fit snugly inside the next consecutive bigger size. My outlet only has two slots; can I remove the third prong from the pump cord? DO NOT REMOVE the third prong from the plug . These pumps are supplied with a 3-prong electrical plug, the third prong is to ground the pump to prevent possible electrical shock hazard. A separate branch circuit is recommended. The pump cord is too short; can I use an electrical extension? Do not use an extension cord. If there is no outlet near, we suggest that you have a ground fault circuit interrupter (GFCI) outlet installed there by a professional electrician. The cord is too long; can I cut it? Do not cut plug from the cord. If the plug is cut or the cord is shortened, then this action will void the warranty. Can I plug in the pump in any 115 volt outlet? No....The National Electric Code requires that a ground fault circuit interrupter (GFCI) be used in the branch circuit supplying fountain pumps and other pond equipment. We suggest that you have a ground fault circuit interrupter (GFCI) outlet installed there by a professional electrician. How high can the fountain spray be? The height of the fountainhead should be not more than half the width of the basin to minimize over-spray and wind-carried mist. How wide should my basin be to minimize fountainhead over-spray? The width of your fountain's catch basin should be more than twice the height of the fountainhead to avoid most water overspray and wind-carried mist. I have no leaks in my basin; Why is my pond losing water? If you recently cleaned your fountain, waterfall, or the pump filter, you may be losing water in your pond due to over-spray. A pump running more efficiently will produce more pressure that can cause intense splashing and over-spray. Over time the splashing will decrease the pond water level. Examine rocks and other decorative elements around your water feature for any signs of significant dampness or splashing, and adjust your pump capacity accordingly.